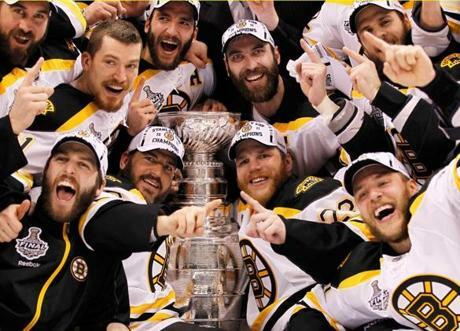 The Bruins celebrated on the ice in Vancouver after winning the 2011 Stanley Cup in seven games. As the series began, signs of support -- such as the ducklings statues dressed in Bruins garb -- popped up around Boston. Chloe Schouela, 2, took in the statues. 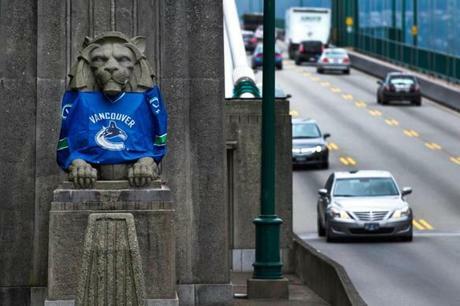 In Vancouver, fans displayed similar team spirit with a statue at the Lions Gate Bridge wearing a Canucks jersey. 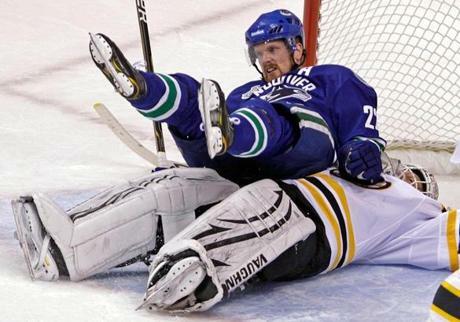 The Canucks' Daniel Sedin sits on Bruins goalie Tim Thomas after a collision in Game 1 at the Rogers Arena in Vancouver. 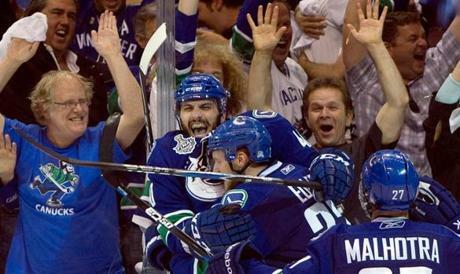 The Canucks exploded in celebration when Raffi Torres clinched the game-winner in Game 1 with 19 seconds left. It was the only goal of the game. 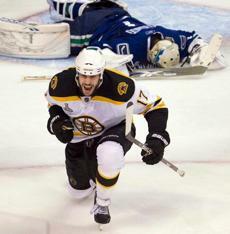 Milan Lucic celebrated after scoring against Vancouver during the second period of Game 2. 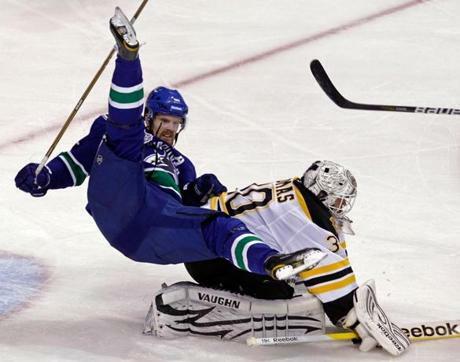 Daniel Sedin sailed over Thomas during a collision in the third period of Game 2. 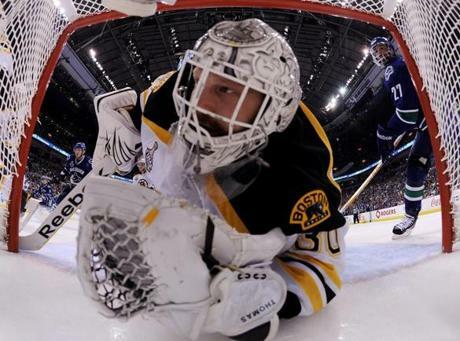 The net cam captured Thomas diving into his net during the first period of Game 2. Vancouver's Maxim Lapierre battled Andrew Ference for the puck in front of Thomas during Game 2. 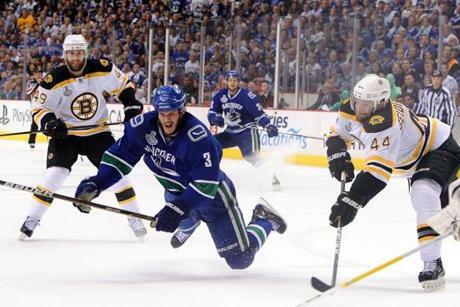 The Bruins again left disappointed when Alex Burrows notched the game-winning goal just 11 seconds into overtime for a 3-2 victory. 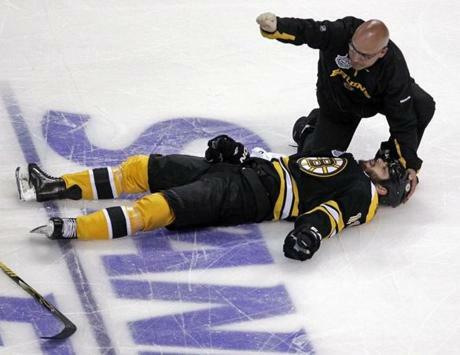 The series seemed to turn in Game 3 when Aaron Rome knocked Boston's Nathan Horton out of the series with a head injury. Horton was carted off the ice. 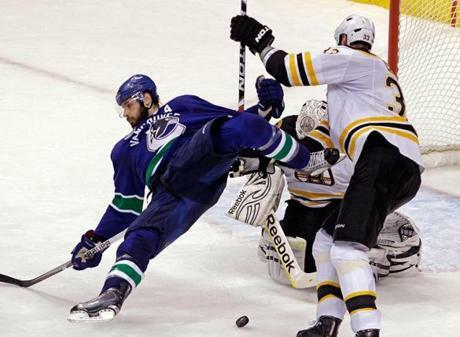 The Bruins seemed to intensify after Horton's injury, and Dennis Seidenberg fought with Vancouver's Ryan Kesler fight in the third period. 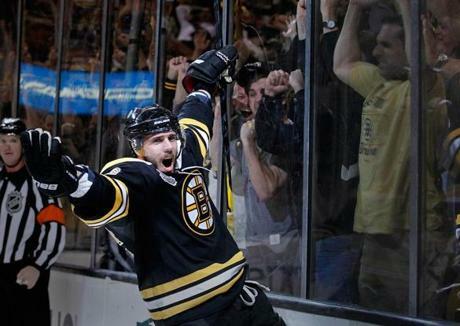 David Krejci and the Bruins had an offensive explosion in Game 3, with an 8-1 win, with all goals coming in the final two periods. The Bruins continued to be aggressive in Game 4, with Patrice Bergeron sending Kesler flying with a hit in the first period. 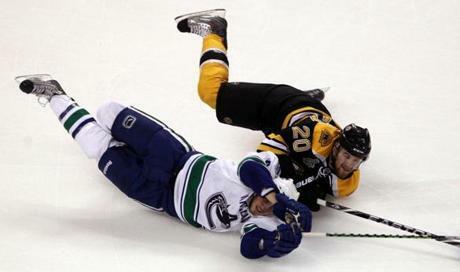 Tyler Seguin then sent Henrik Sedin to the ice after a collision, while the Bruins coasted to a 4-0 win. The Canucks seized the momentum back in Game 5, when they returned home for a 1-0 win powered by a third-period goal by Lapierre. 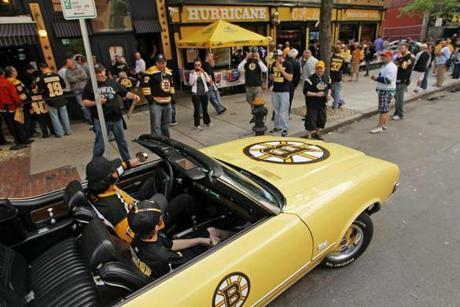 Bruins fans got revved up for Game 6, when Stephen Doran and his son, James, drove their Bruins-themed 1972 Oldsmobile Cutlass Supreme around the streets of Boston. 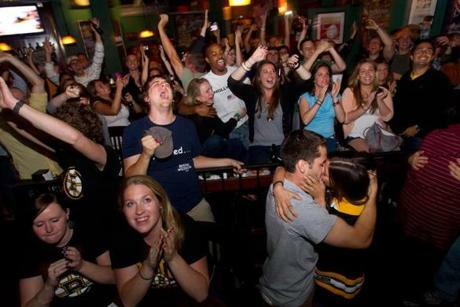 While the series went back to Boston, fans still turned out in Vancouver to celebrate a potential Cup-clinching win. 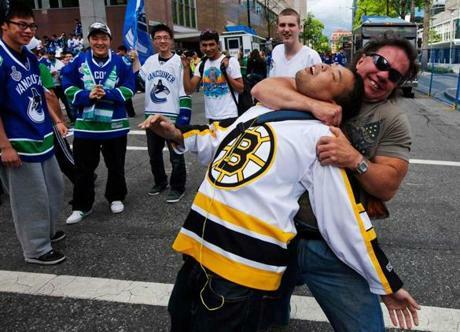 There, a Canucks fan playfully grabbed a Bruins fan. 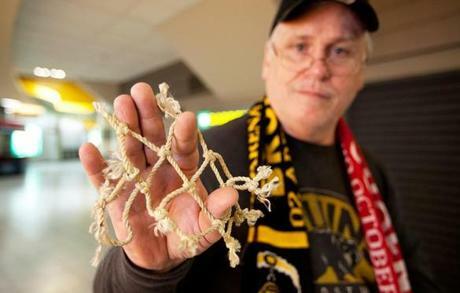 Tom Gannon of Dorchester brought a good-luck charm to Game 6 -- a piece of the net from the game-winning goal that Bobby Orr scored during the 1970 Stanley Cup Final. Gannon's father was a Boston Police officer and got a piece of the net. The Bruins set an early tone in Game 6, with Brad Marchand scoring one of four first-period goals in a 5-2 win. 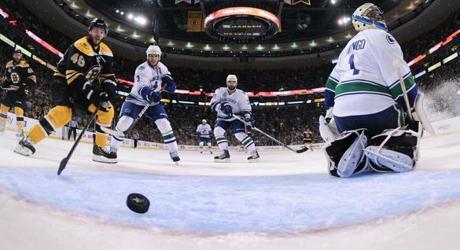 Canucks goalie Roberto Luongo let this puck slip past him before getting pulled for Cory Schneider. 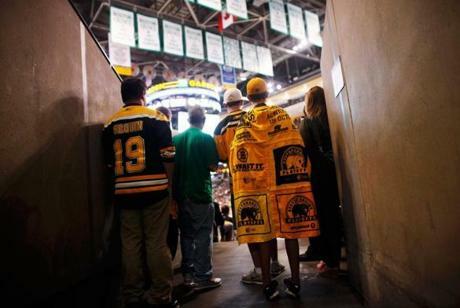 Bruins fans packed the TD Garden for the final series game in Boston. 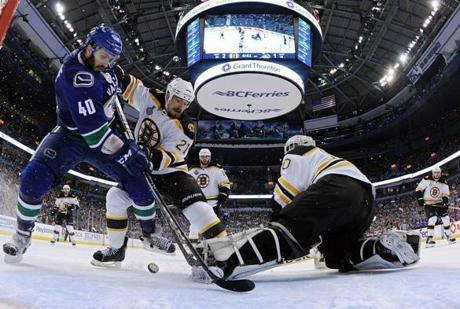 Boston's Daniel Paille took down Vancouver's Chris Tanev during Game 6. 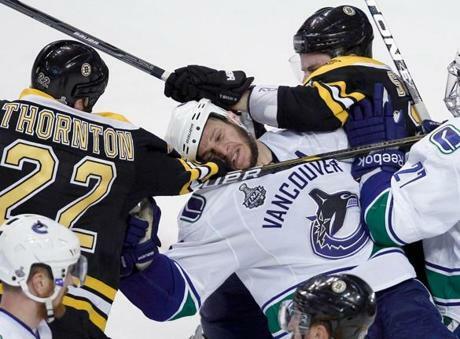 The Bruins kept up the pressure on the Canucks, with Shawn Thornton and Seguin sandwiching Kevin Bieksa during the third period in Game 6. 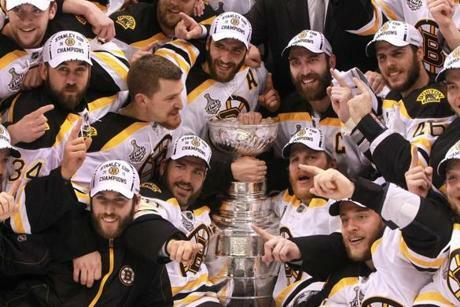 Stanley Cup fever heated up in Boston and Vancouver after the Bruins forced a Game 7. 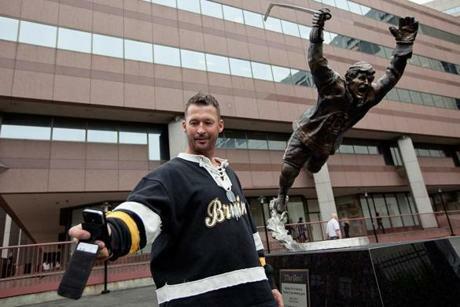 Ian Henry took a picture of himself in front of the Bobby Orr statue at the TD Garden. 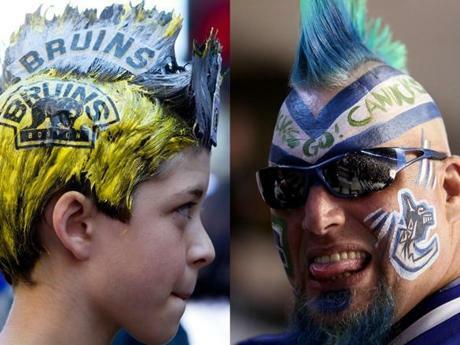 Fans wore their team colors before games in Vancouver, June 15 and June 10, respectively. 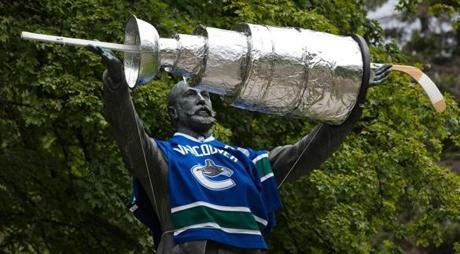 A statue of Lord Stanley was draped in a Canucks sweater holding a replica of the Stanley Cup the day before Game 7. 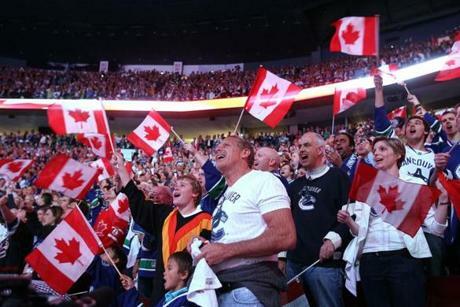 Canucks fans waved Canadian flags prior to Game 7. 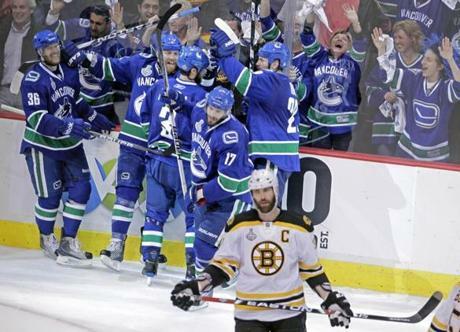 Canucks fans taunted Lucic as he sat in the penalty box in the third period of Game 7. 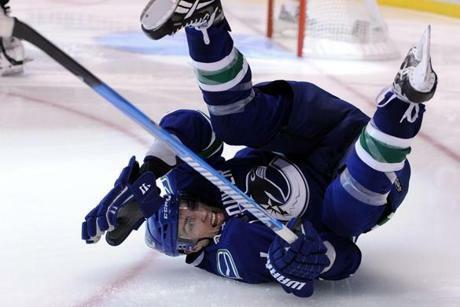 Bieksa fell after taking one of the Canucks' 37 shots in Game 7. Brad Marchand put the Bruins up 2-0 with a wraparound goal in the second period. 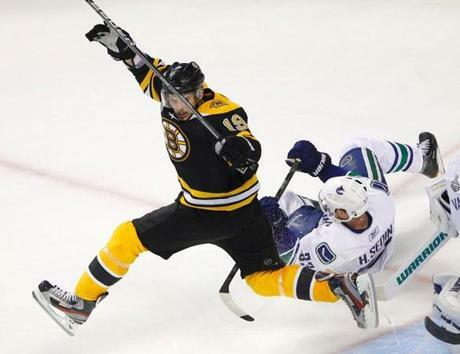 Zdeno Chara leveled Kessler in front of the Bruins net in Game 7. Marchand's second goal of the game in the third period put the Bruins up 4-0. 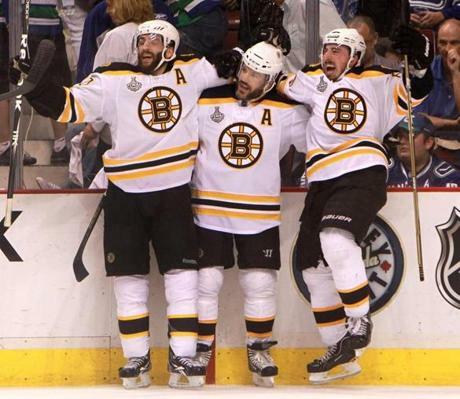 That drew a celebration among Bergeron, Mark Recchi and him (left to right) along the bench. 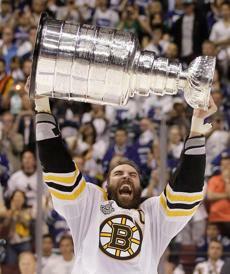 Chara became the first member of the Bruins to hoist the Stanley Cup in 39 yards after the team closed out a 4-0 win. The Bruins gathered for a group photo with the Cup after becoming the first team to win the title while claiming victories in three Games 7. 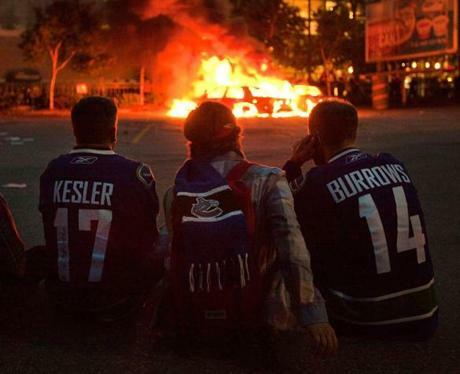 After Game 7, people in Vancouver turned over a car as part of an ugly display of rioting. 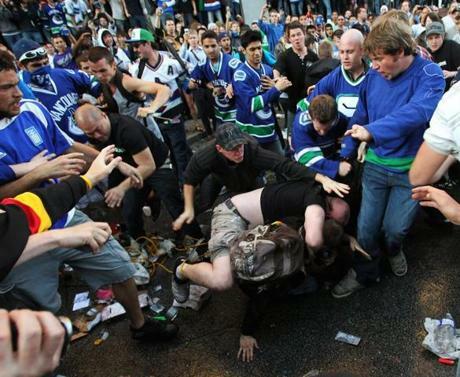 Fights broke out in the aftermath of the Canucks' loss. 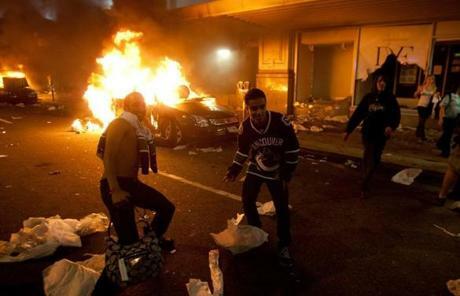 Angry fans ran wild, set cars and garbage cans ablaze and smashed windows in the hours following the game. Fans watched police cars burn in the aftermath. 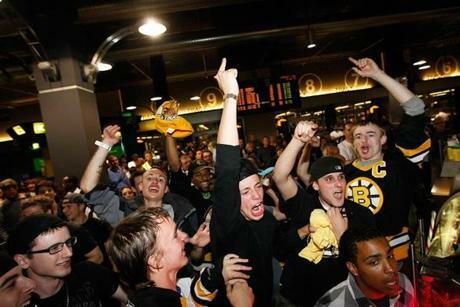 Back in Boston, Bruins fans celebrated the team's first championship in 39 years. 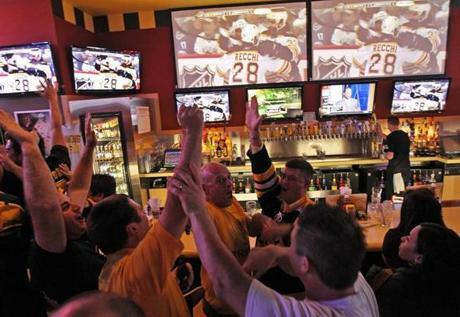 The scene at sports bars was raucous as fans savored Boston's seventh pro sports title since 2002. Alejandro Garbalosa and Kelley Ryan shared a celebratory kiss as the Bruins completed the win. Three days after the game, the Bruins became the latest Boston team feted with a Duck Boat parade. Lucic hoisted the Stanley Cup to the delight of the cheering fans during the parade. 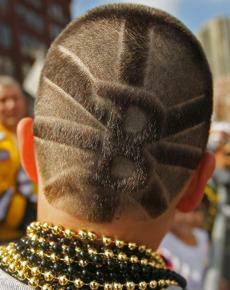 Dylan Carvalno, 9, of Fall River, had the Bruins "B" logo shaved into his hair for the occasion. 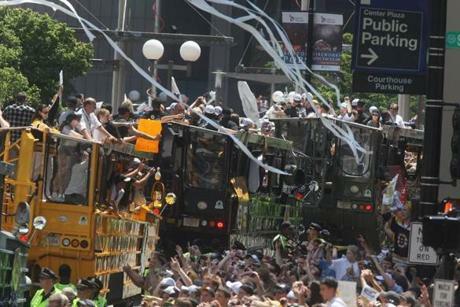 The parade snaked through the streets of Boston in front of tens of thousands of fans. 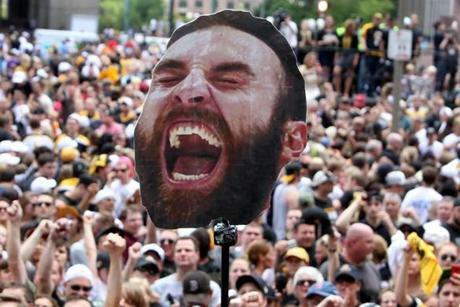 One fan brought a giant picture of Chara to help fuel the celebration.